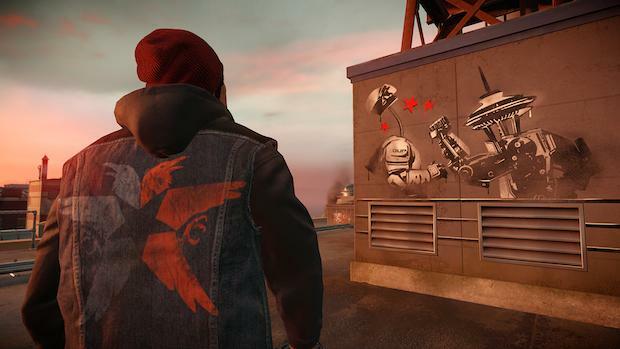 Street art: You use the PlayStation 4’s Dualshock 4 controller as a makeshift spray can to decorate inFamous Second Son’s rendition of Seattle. When Delsin Rowe, the Native American Indian hero (or anti-hero, depending on whether you play it as a good guy or a bad guy) in Sucker Punch’s inFamous Second Son, first comes across a piece of pristine concrete just begging to be tagged, you get a chance to use the PlayStation 4’s Dualshock 4 controller in a most unlikely – but sensible – way. You’re prompted to tilt to controller then shake it – as if you’re shaking an aerosol can, mixing the paint (you even hear the sound that the ball bearing inside an aerosol can makes when you shake a real aerosol can). You then keep the controller upright as you press the R2 button and spray paint over stencils, creating the tag that will decorate the wall. “A man, a plan and an aerosol can,” he says after completing each artwork. Holding the Dualshock 4 like a spray can isn’t the first time you realise that Sucker Punch are going all out to use as many of the PS4 controller’s functions as they can, though. Not long after the game has started (and Delsin has attained his first power) Delsin and his brother Reggie have to be scanned at a Department of Unified Protection (DUP) checkpoint before they can enter the streets of Seattle, where the game is set. Players are told to place a finger on the DS4 controller’s touchpad the move it to match an on-screen representation of a hand. It a sign that developer Sucker Punch aren’t happy with sticking with the basics on its first PlayStation 4 game. There are other uses of the controller’s functionality, much of it using its built-in speaker. When Delsin’s mobile phone rings, the ringtone is audible through the speaker. During one mission where Delsin has to inspect a discarded DUP helmet, radio chatter from the helmet sounds out from the controller speaker, too. And if that wasn’t enough: When Delsin replenishes a power the sucking sound is – you guessed it – broadcast through the controller’s speaker. It’s wild. And you know how you can play the game as a hero or a bad dude, your karma changing depending on which way you behave? Well, the light bar on the controller will change colour, depending on how your tracking in terms of goodness or badness: Blue for good, red for bad. I’m pleased to see what Sucker Punch are doing with the PS4’s controller as this is what developers should be giving us in the current-generation of consoles, not just giving us what we had in the previous generation. Developers that give me new experiences will get my money. So, I’m impressed with some of the tech behind the game but how am I finding the game itself? Overall, I’m enjoying inFamous Second Son – the second half is definitely better than the first – but the powers Delsin gets as the game progresses are impressive, especially the final two. The last two powers really are great fun and can turn the tide in battle. I’m spending a lot of time actually tootling around the city, freeing districts from the tyranny of the DUP in Showdown missions, hunting down blast shards to upgrade Delsin’s powers, saving harassed conduits being beaten by citizens, finding disguised DUP agents, and generally just exploring the city. That said, apparently I’m just about to encounter the game’s main boss for the second – and final – time so it seems I’ve almost completed it. So, how are you finding inFamous Second Son? Update: I’m now facing off against the main boss in the final showdown. So far, it’s been pretty brutal. Update number two: I just defeated the final boss and completed the game. While I thought some of the boss fights had an unfair difficulty spike (one called enormous DUP agent springs to mind), it was a fun game. Now, I’m off to 100 per cent it! Update number three: I forgot to mention that Second Son is the first game where I’ve tried out the remote play feature using the PS4. It works extremely well, although you’ll have to get to grips with a different control scheme given that the Vita doesn’t have physical L2 and R2 buttons. And apart from text often being too small to read properly (or maybe it’s my eyesight), it’s impressive being able to play a PS4 game using my PS Vita, while my wife watches her evening soap opera! I really enjoyed Second Son. It was the first game I’ve played where going for the Platinum trophy (nearly there; 2 more trophys to get) was actually fun. However I will say that in order to do this, I had to finish the game on Expert. I was quite disappointed that the ramp in difficulty from Normal to Expert wasn’t that great. Knowing how badly I struggled in some of the boss battles in Normal, I was surprised to find they weren’t much more difficult on Expert. This may have been because my Normal playthrough was via the Good Karma route, and my Expert one went to the Evil side, but I’d like to think the two sides weren’t that unbalanced. I’m about 20% through Second Son, having just bought a PS4 (would have eventually). It is a very very nice game, but there’s one thing that bugs me about it, which annoyed me in the first Infamous game as well – it’s the “go to new area and complete the exactly same submissions to liberate it”. The main storyline is pretty interesting, but redoing the “find the micro-camera in district X” loses interest after a couple of times. Nice change to the blog btw. Thanks. Yeah, I think while the current-generation games are ramping up the visuals, the game play mechanics are still the same: such as go to this area and do exactly the same thing. It’ll be interesting to see once developers get to grips with the new consoles whether we’ll start seeing some innovative game play mechanics. Time will tell.